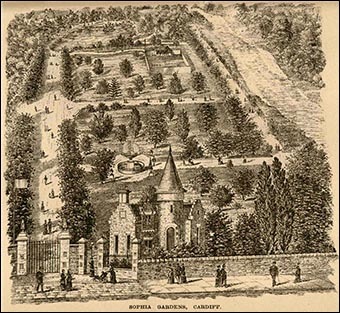 Sophia Gardens was the first publicly accessible park in Wales. Created in 1857, the gardens take their name from Sophia, widow of the Second Marquess of Bute (pictured right). The Bute family owned Cardiff Castle and vast tracts of land in the area, as well as Cardiff’s thriving docks. Sophia is pronounced with the stress on the “i” and rhymes with “higher”. The park was the brainchild of the young Third Marquess of Bute, who had spent time in continental Europe with his mother, Lady Sophia (1809-1859), where they had seen the large parks created for use by the public. On their return the Marquess decided they should create a similar park in Cardiff, so the gardens were laid out to provide recreational space. In March 1857 the press reported that in the coming summer “an ornamental walk and pleasure ground of exquisite taste in design” would be presented to Cardiff’s inhabitants, who would be able to “promenade amidst fragrant flowers and shady trees”. No such ground existed anywhere else in Wales, and Cardiff would set “a noble example to other towns”. By the early 20th century residents from the adjoining neighbourhoods of Riverside, Canton and Pontcanna used the recreation field at Sophia Gardens for cricket, rugby and football. In 1905, Riverside Football Club – which had begun life as a cricket team – decided to change their name to Cardiff City FC, although it was some time before the Football Association of Wales accepted the new name. It was here that Cardiff City played their first recorded match, in 1906, against Barry West End. 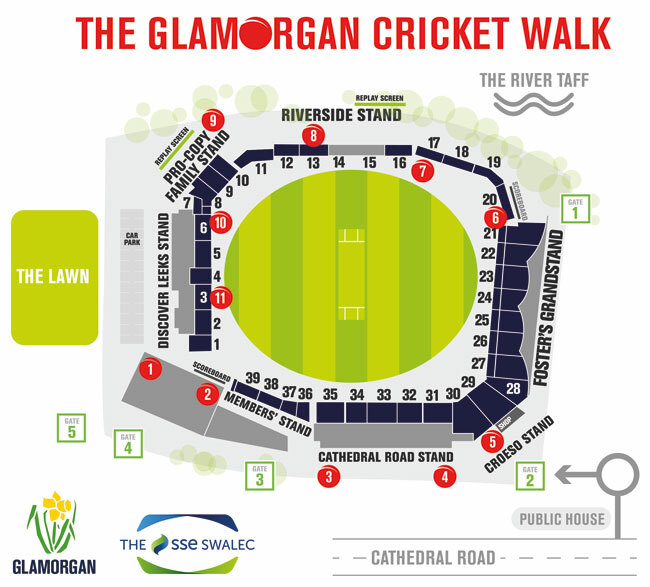 Since 1967 Sophia Gardens has been the home ground of Glamorgan County Cricket Club. The QR codes for this page are at position no 5 (shown in red) on the map below.